Shanesville Lutheran Church is a "traditional" and "forward looking" Lutheran congregation located in the heart of the small "Swiss Village" of Sugarcreek, Ohio. "The church had its beginning about 1820, when Rev. Abraham Snyder, of New Philadelphia was called into this part of the country to minister unto the people of the Lutheran faith . ." as written by W.H Baker in his historical essay "History of the Evangelical Lutheran Church" for the Shanesville 1914 Centennial Book. Abraham Shane, the father of the town of "Shanesville" donated a lot for a German school and meeting house. It is believed that Rev. Snyder moved to a small farm between Shanesville and Ragersville in 1824, and also served as pastor to the Seltenright Church near Ragersville and the Lutheran Church at New Bedford. "In 1828 a new log church building was erected on the hill above Shanesville at the west end of the old cemetery, by the Lutherans and the Reformed." Rev Snyder continued to pastor the congregation until September 23, 1834 when he died and was buried in the Shanesville Cemetery near the church. A new marker was placed on Rev. Snyder's grave as a part of Shanesville's 175th Anniversary Celebration which was celebrated in 2007. The anniversary theme was "Faithfulness: Past, Present, and Future". The present day building (sanctuary) was built in 1849 with an addition being added in 1916. A social hall, kitchen and and educational rooms were added in 1978. In 1981-82, major renovations were done to the front entrance of the original building. It was rebricked (for the third time) to match the social hall and a new bell tower was added. 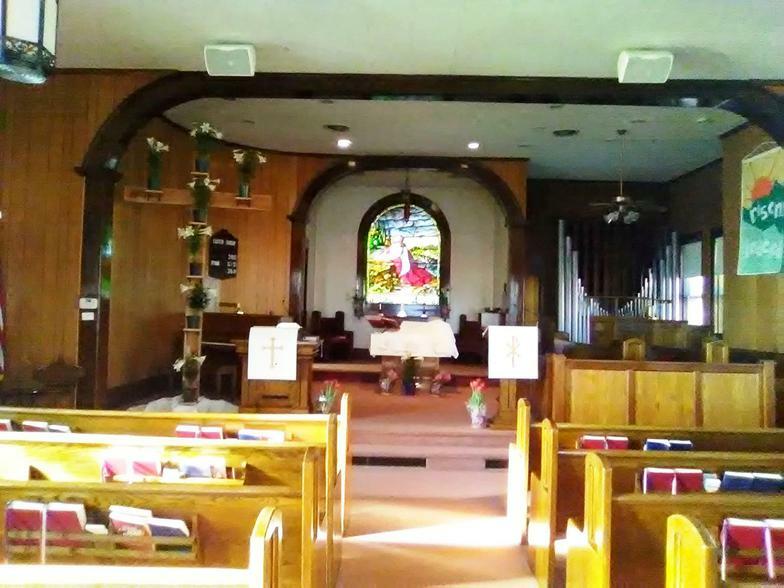 Shanesville Lutheran Church is a "family friendly" and "active" small town congregation working "with the help of Jesus Christ to Reach the World with His Love"
Tuscarawas County. By the year 1875 there were enough people living in the town of Rowville (Baltic) that he was able to begin organizing a Lutheran church for this location. In 1876, a Mission Society was organized for the purpose of accumulating funds to build a new Lutheran Church. At a meeting, held on November 28, 1889 the congregation decided to purchase the land for their church building. In 1892 a brick building was built on the present location. The bricks were manufactured in the village of Baltic. With a new building and pastors' salaries going up, the congregation was running out of money and needed larger offerings. A "tax" was levied on each member of the church. In 1900 the congregation voted to leave the Pittsburgh Synod and join the newly organized Synod of Ohio. A parsonage was built on Maple Street in 1910 for $2,465.16 and sold in 2009 for $42,750. Rev. David Hammel served St. John, Baltic and St. Johns, New Bedford for 40 years. In November of 2008 Pastor David Hammel announced that the congregation would receive a large gift of money from a former member, Mr. Emmet Mizer. A charitable foundation was formed to oversee this gift, which is now being used to reach out to the community. Since Pastor Hammel's retirement in 2009, St. John has been served by Interim Pastors. We are presently in a "Covenant" relationship with The Shanesville Lutheran Church.